While playing, I honestly couldn't tell who was responsible for what area. Not only am I unfamiliar with Chris's mapping style, but the map has quite a uniform character. 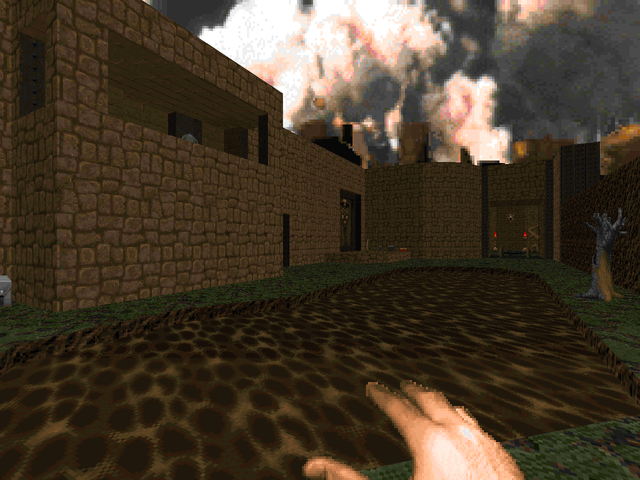 It draws much of its aesthetics from the level it replaces, "The Inmost Dens". Well, more the texture scheme than anything. While there are a few pools of water to splash around in, most of your adventuring is done on (and in!) terra firma. It is also, as advertised, decidedly non-linear. You can explore in one of several different directions, your efforts either opening up pathways facilitating better movement or in a few cases unlocking new areas of the map entirely. If you hit a switch and the result isn't immediately apparent, revisit any previously barred doors. 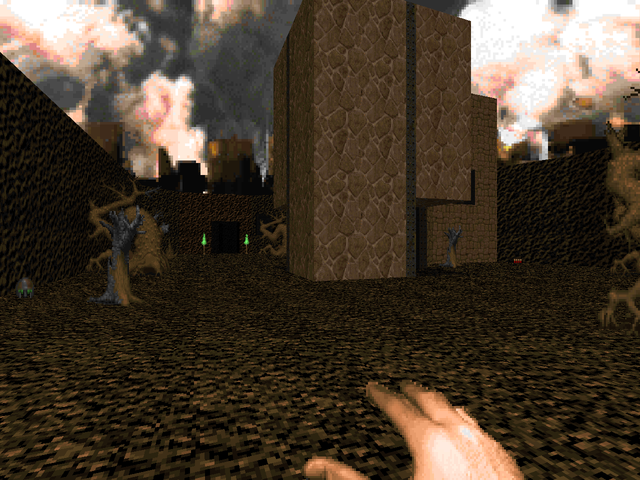 Gameplay is mostly normal room-clearing with a denser assortment of enemies. There are a few flies in the ointment, of course. One of the more memorable fights is a pit trap sandwiching you between two caves full of beasties, so experience in close-quarters combat is a must. The other big fight comes right at the end, when approaching the switch opening the exit. You let lose a swarm of monsters, one of which is an arch-vile. 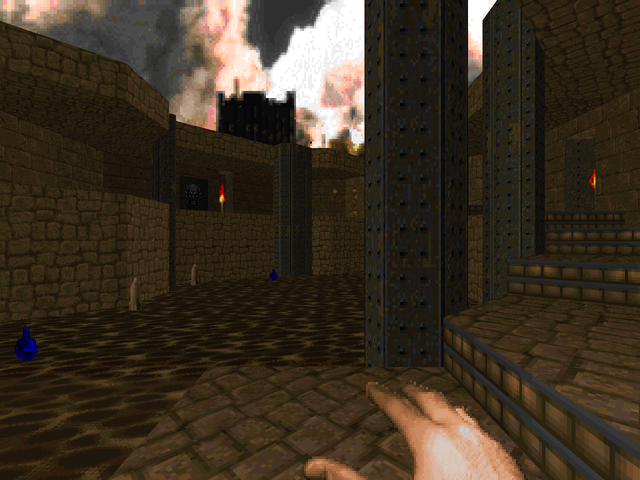 Things get tense here as you have a limited amount of ammo and the demons are no doubt breathing down the corridors. I hope you saved your rockets or it's gonna be a bumpy ride. The battle on your way to the aforementioned switch is pretty good, too. Just some high-HP monsters to serve as a dangerous choke point. I can kind of see where people might get lost in this map, but it didn't bother me any. I did miss the staircase switch on my first pass because I was a little hopped up from the pit trap, which may be what's throwing off some players. Really, if Mike and Chris did some more of these – Doom Done Different, or something (apologies to DominicWhite) – I'd play them. 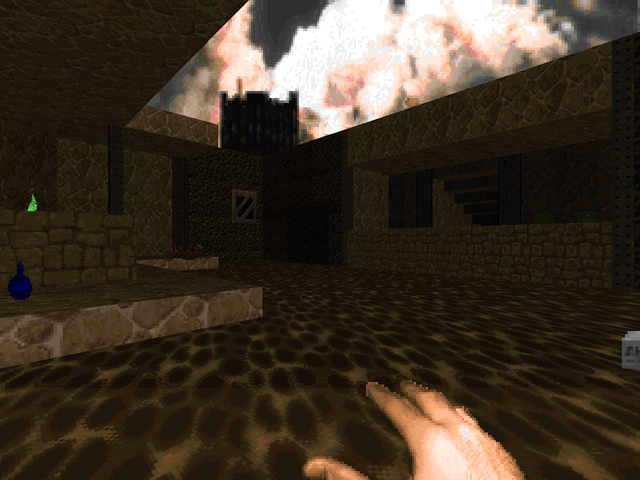 I would recommend Marine's Folly if you're looking for a more complicated take on Doom II that doesn't stray too far from its core values.